There are so many things competing for our attention as mothers, as people. 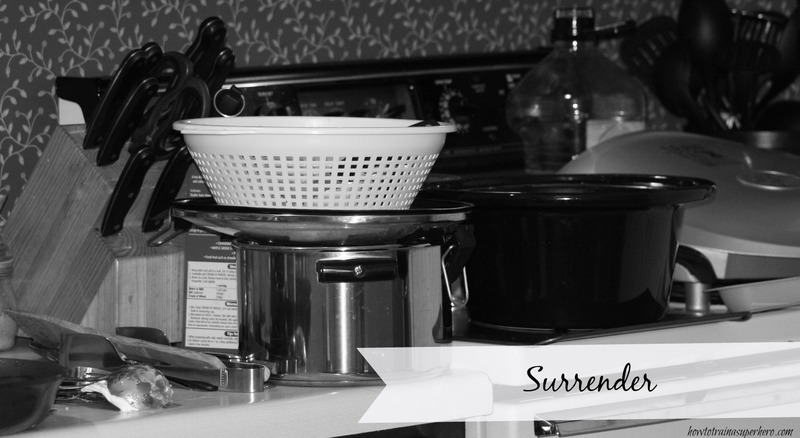 I’ve talked lately about surrendering things in our lives to give more time to God. That certainly doesn’t negate our responsibilities as mothers, wives, or what have you. But it does leave a lasting question of priorities lingering in our minds. 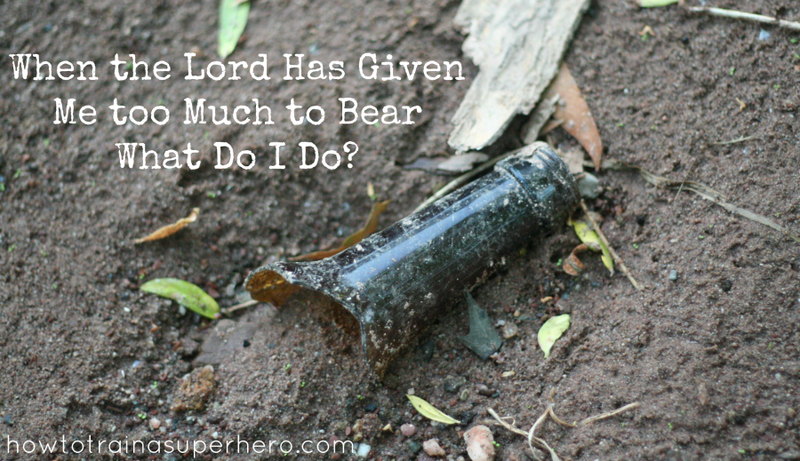 Did the Lord give me more than I could bear? Rest your head, my sweet baby girl. Here is the thing. There is a lot on my plate, some more than I can handle, some that I can easily hanker down. The Lord has given me (us) too much to show me that I am not enough and that he is quite enough. Many of us mama’s get weary or tired or just straight exhausted but the key to redeeming those days is trusting and leaning on God’s unchanging unfailing word. When we find the days keeping us awake at night we can trust that once we surrender the uncontrollable to God, he will give us peace to rest in his name and carry on another day. So what do we do when life keeps us up at night and our burdens are too much bear? We give them to God, we cast them on him because they ARE too much but by his strength we can bear them. Through his will we can do this and trust him. That scripture at that moment came to my mind but there are so many others that we can carry with us and hold on to. Here are some scriptures that I hope encourage your heart and give you the confidence to slow down and rest in him when the burdens of life feel like they are too much. Reminders really that God is mighty and ultimate when our lives are too messy and the things that fill them get heavy. Letting God be our safe haven– In peace I will lie down and sleep, for you alone, O Lord, will keep me safe. Surrendering humbly- Give your burdens to the Lord, and he will take care of you. He will not permit the godly to slip and fall. Waiting on the Lord- Wait patiently for the Lord. Be brave and courageous. Yes, wait patiently for the Lord. Trusting in the Lord- Let all that I am wait quietly before God, for my hope is in him. He alone is my rock and my salvation, my fortress where I will not be shaken. My victory and honor come from God alone. He is my refuge, a rock where no enemy can reach me. O my people, trust in him at all times. Pour out your heart to him, for God is our refuge. Praying while we wait- Always be full of joy in the Lord. I say it again—rejoice! Let everyone see that you are considerate in all you do. Remember, the Lord is coming soon. Don’t worry about anything; instead, pray about everything. Tell God what you need, and thank him for all he has done. Then you will experience God’s peace, which exceeds anything we can understand. His peace will guard your hearts and minds as you live in Christ Jesus. And now, dear brothers and sisters, one final thing. Fix your thoughts on what is true, and honorable, and right, and pure, and lovely, and admirable. Think about things that are excellent and worthy of praise. Keep putting into practice all you learned and received from me—everything you heard from me and saw me doing. Then the God of peace will be with you. Most of us have problems that arise in our lives. My belief is that the way we handle those problems show how much God is at work in each of us. Whether great or small. This phrase stuck strongly in my mind as I reflected on one of those days where I’ve felt defeated as a mom and wife. Attitudes flared that day, frustration was at the core of each situation and stress plagued the night. I just wanted to get through the day without having to wrestle someone and put them in a headlock. What that means to me is that no matter where God takes us on this road to righteousness, his master plan is to refine us by the fire of our trials and tribulation. I slip up and yell some things that probably are best unsaid. I thought some things that God would not have been pleased with and I’m pretty sure my mannerisms displayed it all. But God is working on me…on us. His word is alive and at work in our everyday lives. It heals, restores, and renews. 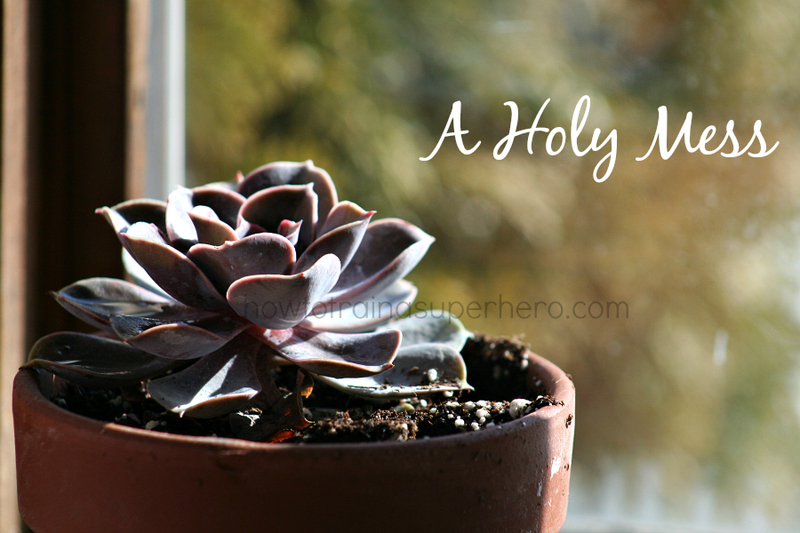 We are holy and we are a mess, still clay in the potters hand being molded and shaped to his design. Motherhood is hard but such a wonderful blessing. Being a wife is an amazing honor but there are times I don’t want to care for my family the way I do and would like to just escape and steal away those quiet moments or better, sleep. I pray today that we mama’s, whether weary, tired or in distress would continue to look to Jesus as the author and finisher of our faith and that we would, even in our weariness, trust the Lord with all of our hearts and continue in the strength of him to get up daily and devote our lives to him by stewarding our families and our lives well. I pray that we will have the strength to go to God and in honesty spill our hearts and let his word wash and renew us. Life for us unravels and we spend a lot of time trying to roll it all up. We work hard trying to get it all together and other times we just let some of those tangles just hang all out. There are times when motherhood is disappointing, when some moments are not wished to be relived. But here dear friends is a reminder that our children are our gift even though we feel undeserved . Our husbands are our blessing, even when we are defeated, and this work that we have been called to, to care for and nurture our needy families, is not useless, unprofitable or burdensome. Sometimes we need to be reminded that our job is valuable and vital, that we are important and appreciated and loved. That even in our messiness, God is choosing and rooting for us. I’d like to share this video today in hopes that it will encourage those mama’s who are burnt out and in need of a joy booster or that reminder. 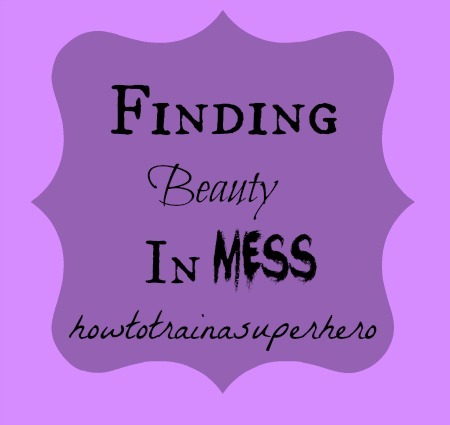 For us moms and women who feel like our mess is bigger than our calling. This is for the MOMS. I sat down for quiet time with the Lord and I proceeded to turn my rusty bible pages to Proverbs. It’s not everyday that I get to sit down to this quiet time, and to be honest, some days my bible barely makes it open. So this year I’ve asked the Lord to renew my thirst for his word and help me to be a little more diligent in showing myself approved. I’m so excited about this because God has truly been meeting me in this place of quiet with him. Anyway. In flipping to get from James to Proverbs, my eyes caught the words of Jesus dead center, so I decided to ask the Lord if that is where I should be. Undoubtedly quiet time is about more than just being still. Everything that makes this idea possible is listening. I don’t know what it was that kept me at this place but I was stuck on verse twenty-two. What was the meaning of this? And essentially what was the Lord wanting me to understand? And then I read the commentary..
“It is possible that this disciple was not asking permission to go to his father’s funeral but rather to put off following Jesus until his elderly father died. Perhaps he was the first-born son and wanted to be sure to claim his inheritance. Perhaps he didn’t want to face his father’s wrath if he left the family business to follow an itinerant preacher. Whether his concern was financial security, family approval, or something else, he did not want to commit himself to Jesus just yet. Jesus, however, would not accept his excuse. Most would agree that the man wanting to be with his father was a valid excuse. But in my mind I can’t help but think, “this is Jesus here.” The alpha and omega, beginning and end calling this man to serve alongside of him as a disciple. Yup, this man was clearly out of whack! But as a mother this is me. Never able to bring my mind fully to the king of kings. Why? because my mind plays subject to so many other things that are happening around me. There’s basketball practice’s, menu planning, serving my husband, household projects and more . Not forgetting that Jesus is my priority but not making much effort to make him that either. Just one more thing needs to be done before that time with Jesus. And before you know it, my quiet time with Jesus or those moments of listening and meditating are victim to a tired and weary momma. In reading this I can already think of some things that need to be surrendered to get more time with God or to stop and realize those little beauties in life that God has given. What in your life is God calling for you to surrender just to be with him? What can be less to give God more? I made the necessary plans, secured a job and set my focus to be a mother instead of a child, and I thought my plans were all worked out. I carefully played along in life acting confident in who I was but in doubt not really having a clue. I worked, went home and tended to my baby boy, being present but unavailable. Nobody counseled me on the hard times, sleepless nights and stress of being a single mother or a mother period. Nor the anger that came from regretting my past mistakes, the insanity I would sometimes face and the constant search of selecting the next man of my life. I ran to people and I let them tell me what the future held for me and the decisions I should make and soon those very same people I learned were the one’s laughing in my face behind my back. I married so that I wouldn’t be alone and hoped that those pieces I thought were missing would be put together again. Well, growing up I learned that looking for love in the wrong place will leave you in a dark, lonely, and frustrated place. I grew further and further away from God and began to get angry at him. Now how does that sound? Me being angry at God for the choices I made and wanting him to make them disappear without reaping the consequences. I wanted a microwave faith. One that worked when I wanted it to. But somewhere in my early twenties through divorce and other things I found myself on my knees begging God to meet me where I was. But he didn’t need to. Why? because he never left, I just pushed him away. Once I realized this truth it opened the door to other things. Things that I convinced myself of weren’t making any sense and God’s truth did. So I decided right there that I would put my faith in Jesus and let him take the woman I saw in the mirror everyday and clean her up. And in exchange he helped me to understand that the battle’s I was trying so hard to fight were overcome in his name. I can’t really say that things got better over night because they didn’t, but me knowing that because I put my faith in trusting in the blood that was shed for me on the cross by Jesus, I was walking in a new way. Not one where I started naming and claiming my future and blaming everything on the devil but a way where I understood the fact that I am a sinner and I will do it everyday. However, in Jesus I have the freedom to go to God, repent and start over again. And guess what? I had the freedom to forgive my self and know that all of my mistakes were nailed to the cross in Jesus’ name. So I know this sounds like what an older person would say but trust me I look back and wish I would have listened to some of those things. 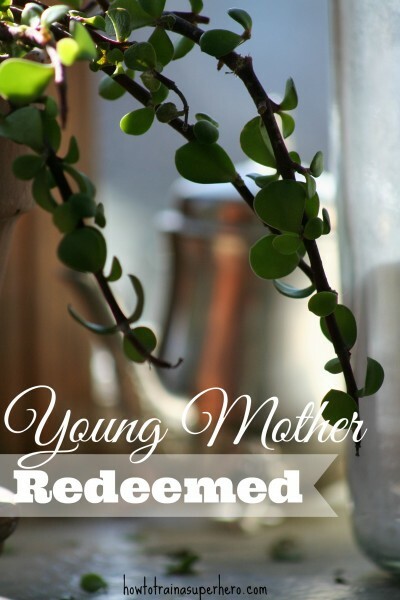 Young mother… you need to know your worth and what you were made for. You were born in the image of a king so great in his majesty that a single look will knock you out. How great is that? Even those ugliest things that you find about yourself are amazing. You were created to worship that king in everything that you do. Being diligent on your job or at school is worship, stepping up as a mother is worship, showing those little eye’s how you depend on God in your singleness or married-ness is worship. Worship God with your life by doing the very best you can do and holding on to God when you have fallen. Wait on God, you are not dented or bruised. You are not trash or reused. You are made whole by the Gospel of Jesus and it’s truth. Your mission is now your child and getting that child to understand who he is and why he was created and for whom he was created. You were created to worship God. Focus on bringing up your baby or babies not having a man or things. 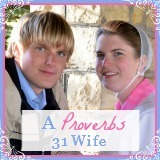 Be an example of what a godly woman should look like. And choose to receive the joy of the Lord everyday. When you have accepted Jesus’ lordship in your life (allowing Jesus to wash you and restore you) you will be able to live redeemed. Knowing that nothing can separate you from the love of God and that he has a plan in the midst of your sorrow, happiness,pain, anger, fatigue and frustration..and that is for you to grow. The Gospel makes people whole…that means it is for you.